Artificial Intelligence (AI) is staggering in its speed of handling simple requests and automating conversations. But AI solutions are not enough for the best customer experiences. Human emotions sometimes demand the human touch that only live agents can provide. 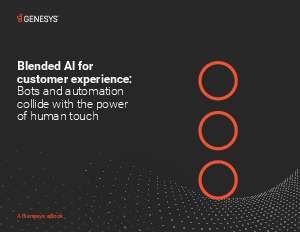 Kate, Customer Experience AI by Genesys, combined with the power of human touch can improve customer experience, empower employees and dramatically reduce costs. This seamless combination of AI technology and humans, or “Blended AI by Genesys,” addresses the entire customer journey for the best possible outcomes.